ETS for Humans - Perelandra Ltd.
Perelandra's ETS for Humans is the perfect solution that fits everyone's needs for any sudden or "unscheduled" physical, emotional or mental situation that can be large or small, serious or passing. It's for all those events that can occur throughout our day that we don't plan for, would have appreciated not happening, and that cause anger, frustration, confusion, pain, panic, irritation, and fear. When these kinds of "intrusions" occur, we immediately reach for and take ETS for Humans. It is pre-mixed, convenient, easy to take, and perfect for those times when we aren't able to think straight. Once we stabilize ourselves with ETS, we are better able to intelligently and calmly turn our attention to what else we need to do to address what has just occurred. ETS is safe and all natural. It may be used by everyone. It may be given to family members, friends, enemies, neighbors, and children. To use ETS best (within the first twenty minutes of the event), it is important to have a bottle within easy reach should one of those unscheduled intrusions occur. (Because they are unscheduled, you just never know when they are going to happen!) This would include having a bottle in the kitchen, bathroom, bedroom, workshop, office, gym bag, school locker, dorm room, computer bag, briefcase, car glove compartment, bike bag, pocket and purse. It's also helpful to keep a bottle by the television and phone when hearing difficult or bad news. If you are klutzy and tend to be accident prone or you have young children running around and getting into trouble, you might just want to hang a bottle of ETS around your neck each morning before starting your day! And if your job entails risk — physical or emotional — you definitely need to keep at bottle with you at all times. Because ETS is safe and natural, you may take it daily and multiple times a day as each situation arises. ETS is an oral solution which is safe for adults and children. Besides taking a dropperful (10-12 drops) orally, you may apply it topically. And for those times when life won't stop and you are overwhelmed physically and/or emotionally, you may add ETS to your bath water and totally submerge your battered self for overall relief. Perelandra ETS has been created by Machaelle Wright and nature using a combination of electrical infusions from 153 different plants, minerals, natural gases and elements found in the sea, atmosphere and on land. During the production process, Machaelle works with nature to combine the components needed. In the first phase of the process, nature restores each element back to its original state of balance, thus eliminating any damage that has been caused by environmental breakdown and human interference. This allows ETS to be made with "clean" ingredients. In the next phase of the production process, the balanced electrical patterns for each of these elements are combined. The somewhat explosive result is a completely new, single, complex electrical pattern that has as its foundation the patterns from all the elements required for the ETS. Important: ETS stabilizes you physically, mentally and emotionally through the electric system after a difficult emotional, mental or physical experience. It does not take the place of needed and qualified medical attention such as having a broken bone set, receiving stitches or taking needed medications. In such cases, you would take ETS immediately after the problem occurs so that you can think straight, make good decisions and get the best medical treatment and care. Note: In the third edition of MAP from 2006, Machaelle refers to ETS for Humans as "ETS Plus" — they're the same. If you are sensitive to brandy, you may order your Essences or Solutions preserved in distilled white vinegar. The prices are the same. I started with MAP conings, professional MAP conings, soil-less-garden conings and ETS for Humans in 2012/13 and can only highly recommend all of that to everyone who needs healing (on any level: physical, emotional, mental, spiritual) and who resonates with co-creating with nature. All of this just works so beautifully, I love these Perelandra products! Thanks so much for making this product available to all of us fellow humans sharing this planet. I have heart-felt gratitude to all the member of Nature and the Perelandra staff who have worked to produce this for so many years. 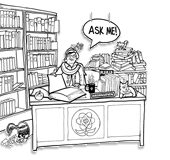 Although I have found many uses besides those officially recommended by Perelandra, I am perpetually amazed that there are still more to discover with each "oops" or "ow" or "yikes." Again, many, many thanks! on 12/3/2015 ETS & MAP Team: A Winning Combination! SO thankful for ETS and MAP! Thank you Perelandra for both! Thank you for sending everyone a 1/2-oz. bottle of ETS to use when we hear of the traumatic events happening around the world. I first connected with Perelandra in 1999, after I was electrocuted at work. I went from bedridden to completely mobile over a 7 year period, and ETS coupled with Medical Assistance Program was a huge part of that journey. Since traditional medicine had nothing to offer, at the time, I felt I had nothing to lose by trying Perelandra products. ETS has been a huge blessing for me and is one of my go-to wellness tools. I'd give this product 100 *s if I could. 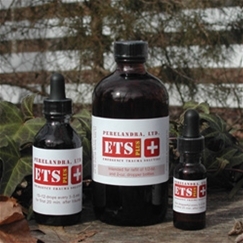 My first experience with Perelandra products was with ETS. I thought at first that these products are just another way for someone to make a lot of money and … well … I just got ETS. I had a bad fall from a horse onto hard ground. Took the emergency protocol. Fully expected nothing to happen but the next day I woke up, realized I should be hurt and bruised and I wasn't. I started reading more and adding more solutions. I now love PIC as that makes it all so much easier. On 20 November I was again thrown from my horse, and this time landed flat on my back. I rolled over, took out my bottle of ETS and took a dose and then called for help. Sadly, no help was readily to hand. After three more doses I got myself up, got my horse back to the barn safely, and drove myself to the Emergency room. I have "lots" (7-11??) of fractures in my spine from L1-4 and T7-9 ... no bruising, not too much pain. Won't need surgery. PIC had me on 25 solutions for a week, but ... ETS is the best!!!! !